Explanation: On April 17th, "Big Sky" country sure lived up to its name. 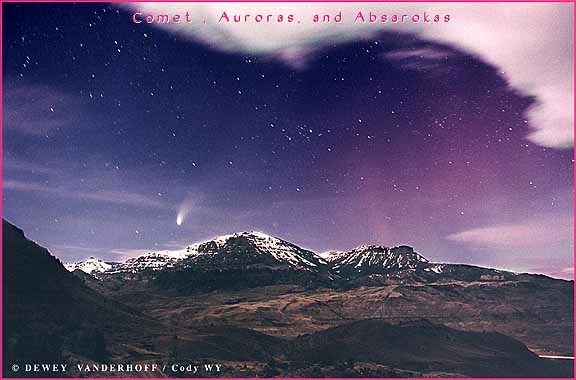 The dark skies over the US states of Wyoming, Montana and the Dakotas were quite busy, as shown by this photograph featuring Comet Hale-Bopp. In the foreground is the Absaroka Mountain Range in Wyoming, lit by reflected moonlight. Just to the left of Jim Mountain's peak is Comet Hale-Bopp. The unusual colors visible on the far right are aurora, remnants of the recent solar storm recorded on the Sun. Across the middle of the photo are numerous bright stars, and across the top of the picture are clouds.